Insert toothpicks into the tops of the strawberries. In a double boiler, melt the chocolate and shortening, stirring occasionally until smooth. 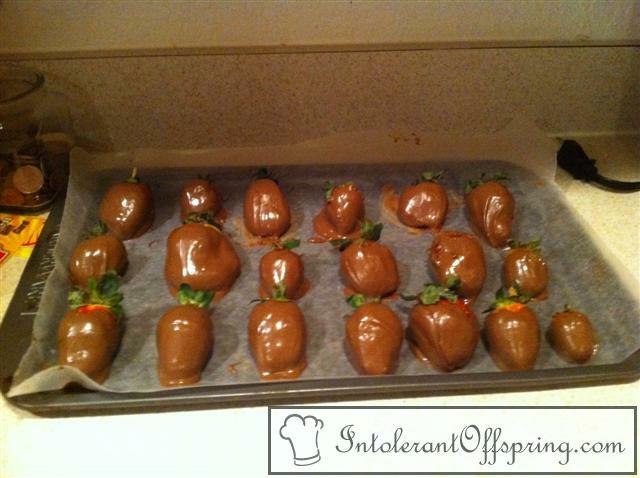 Holding them by the toothpicks, dip the strawberries into the chocolate mixture. Turn the strawberries upside down and insert the toothpick into Styrofoam for the chocolate to cool, or lay on a baking sheet to harden. Tip: When you are melting over a double boiler, don't let the water touch the bottom of your upper pan. Heat until only 1/2 of the chocolate is melted, then remove from heat and stir gently until it is all melted. The chocolate should actually be cool or tepid to the touch. If it's hot, chances are it will seize up and thicken. If it does that, no amount of heating or stirring will fix it.